Eat slowly! Your tobbiko nigiri may be exquisite and you might want to gobble it all down right this instant, but take it easy. It is considered polite to engage in conversation during your meal, without your chopsticks in your hand (or while shovelling hana roll into your face like they’re going out of fashion). Pop your chopsticks down side by side, pretend you’re not a crazed sushi monster for 5 minutes and partake in some civilised conversation. Put used breakable chopsticks back in their packet. Once all the guzzling is done, it is deemed polite to put your disposable chopsticks back into their little paper or plastic sheath. Pop the lid back on. If your miso soup comes in a bowl with a lid, gently squeeze the bowl to remove sticky lids and put the lid back on once you’re finished. Use ginger as a palate cleanser. Not as a condiment. Eat it between courses to get you ready for the next batch of tasty treats coming your way. Use your fingers for sushi. Save your chopsticks for slippery, messy things like sashimi (thinly sliced raw fish and shellfish). Sushi was initially designed as street food which means that you should be able to pick up these rice and fish treats and eat them with your fingers. 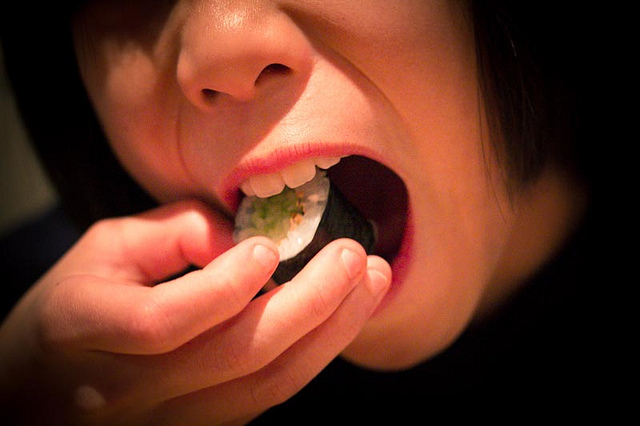 Eat sushi in one mouthful. Sushi is designed to go “down in one”! If you can’t eat a piece of sushi in one bite, your sushi chef (itamae) should hang their head in shame. Of course there are some exceptions to this rule, temaki (large, cone-shaped rolls) are not going to fit in all at once unless you’re an anaconda. Dip the fish side of your sushi in your soy. Make sure you dip the fish, not the rice. This prevents soggy rice floating around in your soy sauce and stops your beautiful piece of sushi from disintegrating. Eat your sushi “upside down”. The fish side of your sushi should always touch your tongue first. This is the bit you’ll really want to taste, so invert your sushi pieces before you pop them in! Use the other end of your chopsticks to pick up food from communal plates. This stops the mouth end of your chopsticks from getting all over everyone else’s sashimi. Makes sense. Pull or push plates and dishes with your chopsticks. We’re not quite sure why this is a sushi no-no, but it just is, OK? Don’t do it. Point at anything or anyone with your chopsticks. This is considered to be extremely rude. Hold a bowl, plate or glass in the same hand as your chopsticks. You may hold your chopsticks in one hand and a dish in the other, but never ever hold crockery and chopsticks in the same hand at the same time. This is very bad manners. Eat ginger during your meal. The raw ginger on your plate is there as a palate cleanser, not as a condiment. Eating ginger with your sushi or sashimi is a huge insult to your itamae as it ruins the flavour of their lovingly prepared creation! Rub your chopsticks together to get rid of splinters. This is very rude. It suggests that the chopsticks (hashi) you’ve been given are of a poor quality which is a big insult to the whole restaurant. Pass food from chopstick to chopstick. This is very similar to a Buddhist funeral rite where human bones are passed between chopsticks. Nobody wants to be thinking about that at the dinner table. Don’t do it. Dip the rice side of your sushi in your soy. The fish and other ingredients are supposed to get the soy treatment, not your rice. Your rice has been expertly flavoured by your itamae so soaking it in soy is considered deeply Not Cool. Mix your wasabi in your soy. Instead, add a little dab of wasabi to your fish where you see fit. Use so much wasabi your face melts. Not only will this not be a pretty sight for other diners, it’s also a big insult to the itamae. If you cover your sushi in wasabi, it suggests that the original taste of the dish was not good enough. It also prevents you from enjoying those delicious subtle fishy flavours, you philistine!